Virginia is such a beautiful state. The pine trees alone are a wonder. All of them so tall and the pine cones! Hahaa, there were so many scattered on the ground, I was tempted twice to carry some home, sprinkle glitter on them and make a wreath! 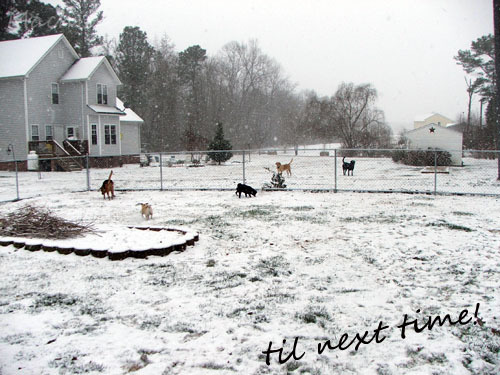 I was also lucky enough to experience the awesome Virginia snow. The second day we were there it snowed an inch, just enough to cover the trees and ground in a lovely white coat. Being from southern California, I don’t get to experience snow often. 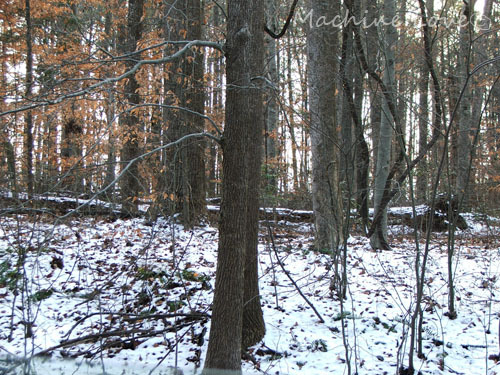 While I had seen snow once before when I was younger on a trip to Big Bear, the Virginia snow was a real treat! 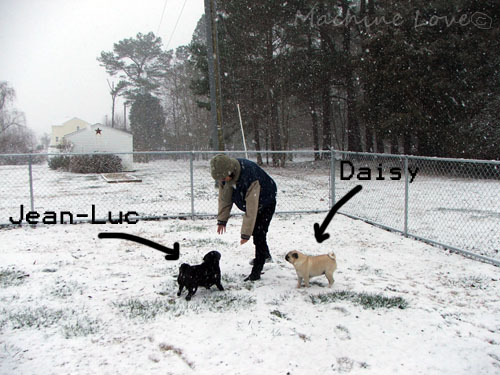 I made a few snowballs and enjoyed playing in the snow with the pugs. The following days’ sun dried up most of it by the time we left. One of the highlights of the trip was the family drum session we participated in. 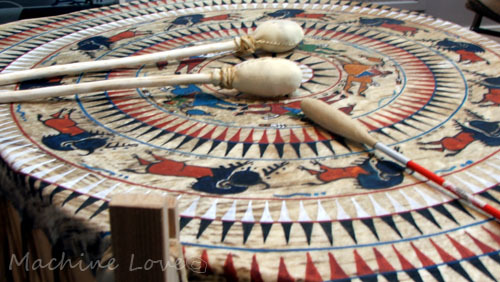 Gilbert’s mother, Madonna, is Lakota and she has this huge, gorgeous leather drum. At one point we all gathered around it. She shared with us some drum techniques and the significance of the different beats and drum. We all drummed together and listened to her share a song. It was a really fun experience! By the end of our trip, I was itching for some creative time and Gilbert’s sister, Felicity, suggested we start the quilt we had discussed making together when I had first arrived. I told her about the quilt I wanted to make for my baby niece and we decided to make one for her. Luckily, Madonna, a quilter herself, had fabric and a sewing machine with all the fix-ins. I knew I didn’t want the quilt to be very large, as I wanted to finish it within a few hours and it was for a baby after all! Assorted Fabric; enough for a 25.5 x 25.5 inch quilt top and back, including some for 100+ inches of bias tape or pre-made bias tape. Awesome, now that we have our tools, we’re ready to rock! Pin the squares together, 5 at a time. Using your machine, sew these squares together, minding the 1/4 seam allowance. Iron seams. When you have 5 strips of 5 squares each, pin the strips together and using your machine, sew these together, minding the 1/4 seam allowance. Continue until all strips are sewn, ironing seams as you go along. Now you have your quilt top! Let’s talk about the back of the quilt. For the back of the quilt I picked my favorite fabric from the ones we chose and cut out a large square from it. Cut a 25.5 x 25.5 square from your choice of fabric, this includes the 1/4 seam allowance. Now we have the two sides of our quilt. With the wrong sides facing each other, pin your quilt top and back together. Using your machine, sew the two sides together, minding the 1/4 seam allowance. We’re almost done! Now we’re ready to take care of those raw edges with our bias tape. You’ll need a little over 100 inches of bias. Once you have your bias tape made, or you have your store-bought pre made bias tape, line the bias along the front of the quilt’s raw edge, pin. Continue to pin tape along the front of the quilt, turning corners until you reach where you began. Cut off excess. Using you machine, sew the bias tape and quilt together along the tape’s ironed crease, the one that’s closest to the raw edge. 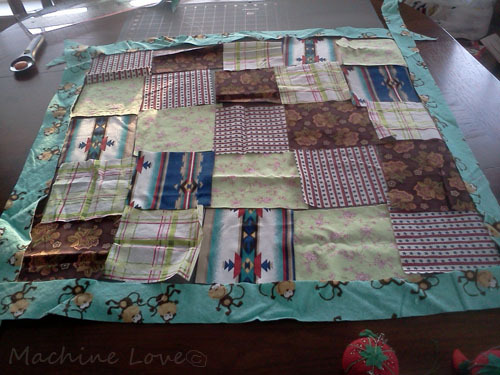 Continue to sew the tape around the quilt, pinning and sewing corners accordingly. Once done with sewing the top, turn the quilt over and fold the bias tape over to the side now facing up. Pin in place. Now, using your machine, sew this side of the tape around the quilt. We’re done! 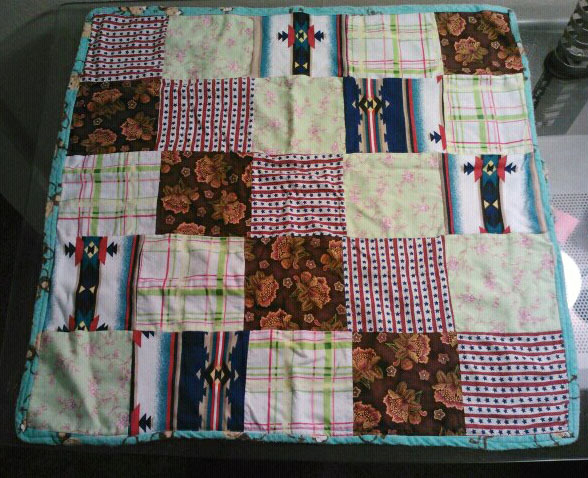 A cute quilt for a newborn baby. It’s simple and a great gift idea with heart. When I got back to Los Angeles, I gave my brother and his girlfriend this quilt for my niece and they loved it! We started our quilt at 5:00 pm and after taking a few breaks in between, finished it by 8:30. So it only took about 3 hours for us to complete the quilt including making our own bias tape. 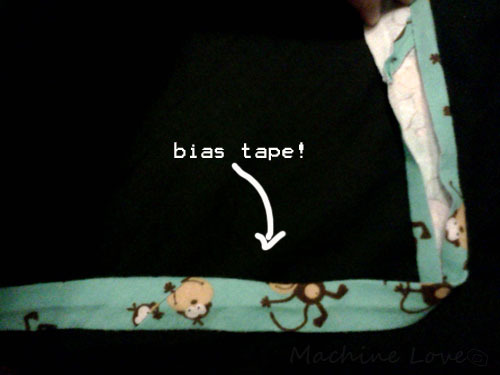 If you’re working alone and use pre-made bias tape, you can finish just as soon. 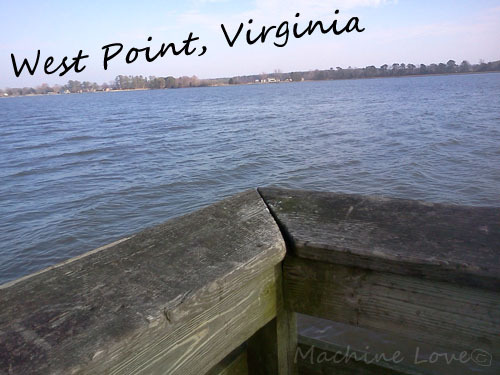 I really had such a wonderful time in Virginia with the family and am happy for the great experience I had out there. 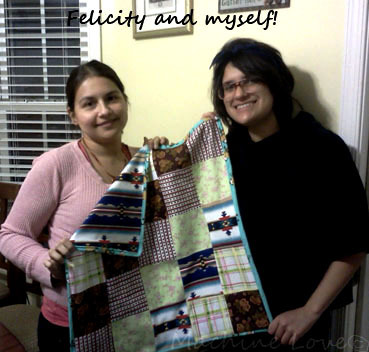 I’m glad I got the chance to make the quilt for my niece while in Virginia. Since I did, that means the fabric I had originally bought for this quilt can now be used for something else. I’m thinking pillows, maybe! Hahaa, so many projects to do!